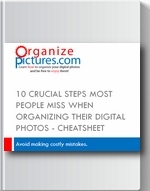 If you have been taking digital pictures for a while you’ve probably been forced to deal with organizing your pictures. You have also probably been asking yourself if the method you’re using is a good method. Currently there are two different approaches to picture organization: using tags and using folders. There are a number of software programs that support either or both methods. Which method should you choose? This article will analyze the tag and folder based methods for picture organization. This method involves assigning one or more tags (or keywords) to each digital picture on the hard drive. For example: let’s say that I take some pictures of my grandma’s birthday this year in 2007. Let’s also say that I’m taking 100 pictures. I download them to my computer into some folder (the name of the folder is irrelevant at this point) and bring up my organization software (you always need one if you’re using tags). The software imports the folder and I see all my pictures that I have just taken. Then I assign some tags to all of them or a part of them…this is called bulk tagging (this feature is a must for any tagging software). So, I assign the following tags: birthday, grandma and 2007. Next, let’s say that I’m taking some pictures of my daughter Cristina at her own birthday in 2007. So, I go through the same process and I assign the following tags: birthday, Cristina and 2007. 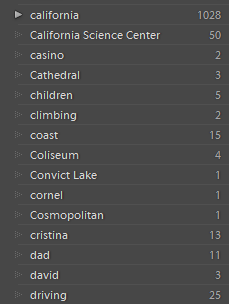 Now, the key is that the tags represent categories, your own categories. So, if you want pictures to fall within the same category then you have to use the same tag. In this case a tag called birthday is different than a tag called birthdays. Software usually allows you to manage your tags and will help you choose the right tags. The main purpose for creating and assigning tags is that you would be able to easily find your pictures. So, let’s say you’re looking for birthdays in 2007. Then you would open up your organization software and do a search on birthday and 2007. This will filter out all the other pictures and will show you only the birthdays in 2007…assuming you have tagged them correctly. If I want to see all of my daughter’s pictures I would search for: Cristina. This would only show pictures that contain the tag Cristina. The key advantage here is that one picture can belong to many keywords or tags. I can assign as many tags as I want to a picture. So every time I’m searching for one of the tags assigned to a particular picture, that picture would show up in my search. There are two ways (with some variations) in which software programs apply tags (or keywords) to a picture. The most widely used method is to embed these keywords in the image file itself by adding a little bit of text containing the keywords. This way the tags stay with image and they “travel” with the image. There are two main standards used for embedding tags into images: IPTC and XMP, the latter being the newest and most popular standard created by Adobe. There are free software packages that can write tags to your images if you choose to do so (i.e. XnViewer). Other software packages apply “labels” to pictures and rather than writing to the image files themselves, they create a database with the keywords for each picture. This database is usually a file that is saved and updated on your computer every time you apply one or more labels to your pictures. This “tagging” method will make you dependent on the particular software you’re using and your labels will not “travel” with your pictures. What do I mean by folders? I mean simple folders that you create on your computer hard drive. These folders contain groupings of files that you think share something in common. For example: a folder called My Pictures contains all your pictures taken during family trips, with your kids and at various events. In order to further organize your pictures you may choose to create sub-folders within the My Pictures folder. You may create sub-folders like trips and kids and split your pictures accordingly. The whole purpose of creating folders and sub-folders is to divide the quantity of files present on your hard drive. This is a classic application of the divide and conquer principle. One can manage complexity by dividing the quantity of objects into smaller and contained portions. Now, this is pretty simple stuff, and if you know how to use the Internet you should be very familiar with creating folders and sub-folders. However, even though this is very basic, there is a common problem that most people face. Most people don’t spend much time thinking about the names of their folders. Pretty much what comes to mind first, that’s the name of the folder. While this may work for a short while, in the long run it doesn’t solve the clutter problem. Actually, it may make it worse because we can create multiple folders with similar names and then forget we created them and create a new one. Folder name includes a date for its content (2011-01 = January 2011). The day is optional but if you know it, add it. The more you know the better! Choose one separator and stick with it. If you use hyphen fine…stick with it, if you like an underscore then use that. Just don’t mix them. In addition I prefer not to leave blank spaces in the folder names. I know that modern operating systems allow you to do that, but I just don’t do it…no blank spaces. What this folder naming convention accomplishes is very simple: you’re actually embedding “tags” into the folder names rather than into the pictures themselves. You can assign multiple tags to a single picture. This means that one picture can belong to multiple categories without having to copy the same image to multiple folders. This is the most important pro of the tag method. You don’t have to spend anytime naming the physical folders on your hard drive. You can simply download your pictures into the default folders your camera creates and then just apply tags to the new pictures. (I recommend that you also put some time in creating a consistent folder structure and then apply tags to the images.). You really have to be careful about what software you’re using for applying tags. Some software doesn’t use widely accepted standards (IPTC and XMP) but use their own proprietary way of recording image tags. If you decide to use such software then you are really tied to your software. You can’t really share lots of picture folders with your friends…unless they’re using the same software (or compatible). If they’re not, then they have to figure out what is in the folders you’re sending them (if you haven’t named your folders appropriately). You have to be careful about developing tags (read this article to find out why you need to be careful). You have to make sure you don’t develop duplicate tags like:birthday and birthdays. They will mess up your search capability. It is very time consuming because tags have to be applied to all pictures. It is true that you would never do it one by one, but rather in groups; however, it is very much time consuming. When should you use the “tag” method? The only very important reason for using the tag method is if you must be able to assign the same image to multiple categories (tags). If you must be able to search your pictures based on more than one criterion (i.e. events), then you have to use the “tag” method. Remember that even when you choose to use tags a carefully constructed folder structure should be used as the foundation on which you construct your tags. An organized folder structure is independent of any software used. In fact you don’t need any software…you can simply use only the operating system to create and change the folder structure. Folder structure is completely mobile. You can transfer entire folders to other computers or drives and the order and meaning of folders is maintained independent of operating system and software used. Carefully constructed folder names will help you find your pictures very quickly. You can use the “tag” method on top of the folder structure created using the folder structure. This way you can use both methods to their maximum potential. Each picture is assigned only to one folder. (Unless you want to copy the image in multiple folders. This doesn’t make much sense though). This is the only major drawback to this method…and it is indeed major. When should you use the folder method? You should always create a consistent folder structure for your pictures based on your criterion. Most home users do not need the extra power of the “tag” method. However, if needed, one can easily (depending how much free time you have) build efficient tags on top of a folder structure. Just looked up Adobe Light room, it’s quite expensive, do you know of any that are less costly, like free? That’s how much i have been paying for Windows Live Photos all these years, I see that was quite a good deal. Helene…a cheaper alternative is AcDSee Photo Manager or Zoner Photo Studio X. You can try XnView as well which is free. I have 5,000 pics all tagged by description, searching and sending by tags worked well for many years now but somehow Microsoft, Windows Live Pictures it seems will not let me search by tags anymore. so looking for software that will do just that, This website has been very helpful, Sounds like Adobe Lightroom will do the trick? Just checking, I just need it to send friends my pics and do not want to re organize into folders. Helen…for Windows you have a few more options. You can try XnView because it is free and it allows you to search by tags. Then besides Adobe Lightroom, you can try Acdsee Photo Studio Manager or Zoner Photo Studio X.
to use the windows search with tags you have to check that your folder is correctly indexed (see https://www.tomshardware.com/reviews/windows-10-index-files-improve-search,5593.html). Regardless this is a very interesting article. What has not yet been mentioned are the possibilities of automatic tagging of photos. There is today software which tags the photos automatically. For example, OneDrive does that with photos stored there. For local photo collections, there are software such TagYour.Photos, this software automatically tries to identify appropriate keywords or sights. I have an 8TB drive separate from my mac. All of my images go into a “To Be Sorted” folder. From there they go into folders labeled by years. In this case 2003 thru 2017. Within each ‘year’ folder I have folders labeled (i.e. Jan-Mar or Jun-Aug NY vacation). Once I sort through all the files (about 50,000) I plan on using Lightroom. I’ll import the picture file which contains all the ‘Year’ folders. From there I could tag the photos with key words and be set. Does this sound like a reasonable way to go? Most of my images are from my iPhone. What do I do with the video files? Do I include them with image files in the folders or do I create a separate video folder? Does all of the Geo tagging and metadata stay with the image or video file when moving it out of photos and into Lightroom? If so where does this information reside on the file? Dan…please use the contact page so I can reply to you via email because the answer would be too long for these comments. Your plan for folders is ok somewhat…for getting started even though it is a lot more helpful to the invest some more time in efficient folder names based on events. This is time well spent as visually navigating folders is very fast and efficient. Video files should go in the same folders where the image files from the same event are. Make sure you delete your images from your iPhone once you transfer them to your computer…otherwise you will have lots of duplicates. Yes…all the tags will be written inside the image files and will be readable by most software. Lou Ann…great question! Adobe Lightroom will do the job. It is a much more robust program for editing/creating image metadata including keywords. I have 5,000 pic I need sorted, what I need is to scan pic add to a folder then drag and drop in the order I decide at the time. As I come across pic I need to put them in order. Sounds like you have a good plan Lewis.